If you missed the opening keynote by NVIDIA CEO Jen-Hsun Huang, here’s a recap of today’s announcements at the GPU Technology Conference in Silicon Valley. In the video, NVIDIA VP Greg Estes covers the new NVIDIA SDK, Iray VR, Pascal-based Tesla P100 GPU, DGX-1 deep learning supercomputer in a box, and DriveWorks platform for self-driving cars. Watch Jen-Hsun’s complete keynote at the GPU Technology Conference. 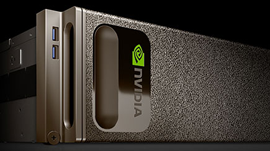 Learn more about all the announcements on the NVIDIA Developer website.